Monday night sees what is for all intents & purposes a Premier League title decider as Manchester City host Manchester United at the Etihad in maybe the biggest domestic game of football in the last ten years. Will United's old guard, so full of experience & with mantelpieces full of winners medals already be able to keep the hungry upstarts, backed by billions at bay? We've had a look at the fixture & tried to find a few betting angles in what will be an engrossing fixture for even neutrals who haven't had a punt. The football season is drawing to a close & we'll soon be concentrating more on the flat racing season, we had 3 winners from 3 picks on Sunday & you can keep up to date with the latest posts by following us on Twitter @LikeBuyingMoney either click the Follow button above or find us on there. 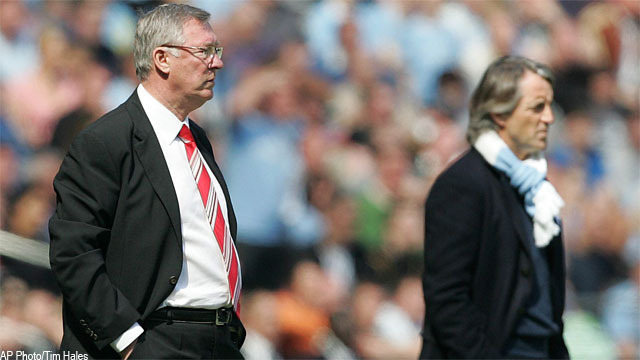 Sir Alex Ferguson summed up how difficult it is to call the result of this match when noting that his United side were coming here to the Etihad with the league's best away record only to face up against City who have the league's best home record, the Citizens are unbeaten here all season & have only dropped points the once when drawing 3-3 with Sunderland at the end of last month. That game against Sunderland has rather symbolised City over the past couple of months with them looking out of that game & the title race only to continue to battle right to the end & drag themselves right back into things with every chance of getting the win. 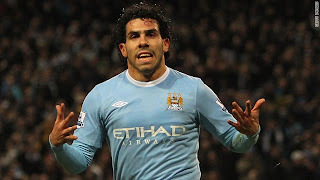 Carlos Tevez's return has been a catalyst for City's very recent impressive form, with him & fellow Argentinian Sergio Aguero really striking up the type of partnership that was anticipated & eagerly hoped for by City at the start of the season. The City strikeforce is backed up by a superb mix of solidity & style in midfield with Gareth Barry & Yaya Toure controlling many games between them this year & giving the ball to players such as Silva, Milner, Johnson & Nasri who can provide the openings for the strikers. It's often said that the midfield battle is where games are won & you'd have to worry for United if they played with the same setup seen in the last few weeks with a pretty much orthodox 4-4-2. Paul Scholes & Michael Carrick were simply bullied & overrun against Everton at times last week & Ferguson will surely stick another player into the centre to help them out, that could be Wayne Rooney but that would leave them a little light up front with Hernandez, courtesy of a hot run back in October/November the only other player with double figures in league goals. It seems unlikely that Hernandez will be starting in this one though, some of his recent displays have been of a very low quality with poor link up play & getting caught offside on numerous occasions, instead Danny Welbeck could be trusted to lead the line on his own, the young Englishman has been adding more consistency to his displays but now needs to start adding the goals that will see him become a feared striker. After United conceded four against Everton a last Sunday an awful lot was written & said about a 'dodgy defence' but that may be a little unfair as they've conceded the 2nd least amount of goals in the league (32) behind only City (25) & if you took out the extraordinary 4-4 last weekend & the incredible 6-1 in the reverse fixture then they would have looked outstanding, in the league at least. United have 17 clean sheets from 35 games so there isn't anything fundamentally wrong defensively & that's with missing arguably the world's best centre back in Nemanja Vidic for most of the season. Rafael remains a worry at right back as he seems to lack composure at times & has a questionable temperament & City may target him here, Ferdinand & Evans sometimes look a little ill at ease with burly old fashioned centre forwards but may be more comfortable against the technically excellent Tevez & Aguero. City's defence has been magnificent, especially at home where they've conceded just 10 goals all season & it looks like Micah Richards will be fit & ready to replace Zabaleta after missing their last two games. City have won their last three games & only conceded once in that little run when beating Norwich 6-1 but when you take a look at the opposition they have faced two promoted teams including woeful Wolves away from home & a limited West Brom side at home, before that they had gone on a run of 5 games with just one win (2-1 against Chelsea) so it would be unwise to take too much from the last three. City looked pensive at times against Wolves last weekend & although never in danger of conceding it was maybe illustrative of Mancini's dilemma here, do they go all out for the win from the start, do they push on if they get a lead? The game really is a tough one to call for either team & we're not going to, City's recent form has probably been overplayed & so have United's defensive frailties, at the same time it's difficult to imagine a goalless draw as City have had only one all year (at West Brom) & United haven't had one at all. The draw is available at 5/2 & don't worry about Ferguson saying United always go for the win, that's nonsense as anyone who saw the Blackburn game at the end of last season will testify, Ferguson is the ultimate pragmatist & will happily settle for the draw that would put his side in the driving seat. We said we don't like a 0-0 result so how about 1-1 instead, the price for that is 13/2 with several firms & we're huge fans of Carlos Tevez's footballing ability - it seems the script is written for him to score here, back him to score first & the 1-1 draw at 40/1 in a scorecast.